Pardee Homes’ Corterra features three modern two-story floor plans with up to five bedrooms and up to approximately 3,309 square feet. Prices start approximately from the high $400,000s at the neighborhood, in a well-established area of Henderson off of Horizon Ridge Parkway, just east of South Valle Verde Drive. For more information on available homes, visit pardeehomes.com or call 702-602-9684. Corterra’s three model homes have been designed by celebrity designer Bobby Berk of Bobby Berk Interiors + Design. Berk is a member of the “Fab 5” in Netflix’s popular remake, “Queer Eye.” His award-winning work can also be found at Pardee’s Axis, Strada and Nova Ridge neighborhoods in Southern Nevada. 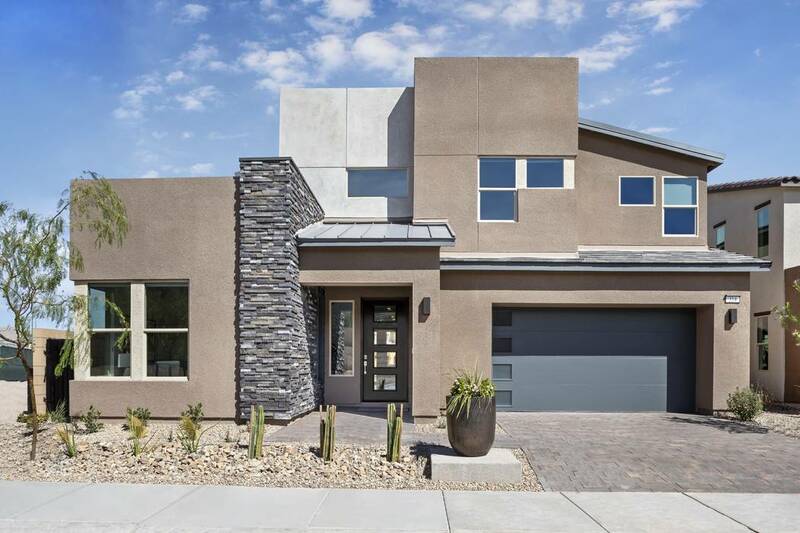 Stylish exteriors at Corterra include Desert Contemporary, Modern Spanish and Nevada Living, per plan and are enhanced through Pardee Homes’ LivingSmart program offering energy-saving features and options. A move-in-ready Corterra Plan 1-A at oversize homesite No. 8 measures 2,652 square feet with four bedrooms, three baths, loft, upgraded kitchen countertops, cabinets and appliances and Pardee’s Home Smart 2.0 that includes Amazon White Glove Service. It is priced from $495,816. Also at Corterra, a move-in-ready Plan 2-C at homesite No. 7 measures 2,867 square feet with three bedrooms, 2½ baths, downstairs den/office, loft, upgraded kitchen cabinets and appliance package, upgraded designer flooring throughout and Pardee’s Home Smart 2.0 that includes Amazon White Glove Service. It is priced from $503,121. Pardee has been building homes and communities in Southern Nevada since 1952, including neighborhoods in the Green Valley area of Henderson for more than 30 years. In addition to Corterra, the builder’s active Henderson neighborhoods include Strada and Linea in Inspirada and Axis and Pivot near Green Valley Parkway and Carnegie Street. Pardee Homes’ Make Your Move to Modern Sales event showcases move-in-ready and under-construction modern designs at the builder’s Southern Nevada neighborhoods. These select homes also include special incentives such as a closing cost credit and bonus design studio credit, as well as the opportunity to lock in an interest rate. New Home Gallery hours at Pardee Homes’ Las Vegas Valley neighborhoods are 10 a.m. to 6 p.m. Tuesday through Sunday and 2 to 6 p.m. on Monday. Pardee Homes Las Vegas builds new homes and communities for first-time through luxury homebuyers. Established in 1921, Pardee Homes was among the first to embrace master-planned community concepts, green homebuilding measures, environmentally sensitive development practices and customer-focused processes for new home purchases. Pardee Homes Las Vegas has built more than 40,000 homes throughout Southern Nevada in the last 67 years. Pardee Homes is a member of TRI Pointe Group, a family of regional homebuilders. For more information, visit PardeeHomes.com/Region/Las-Vegas.